Produced by Kenn Fox. All arrangements by Kenn Fox. Sacred Wood features 14 new solo guitar compositions showcasing guitars by Josh House, Mcilroy, Webber, and Northwood. * The CD booklet provides technical info, and tunings for all compositions are available at www.kennfox.com. Tablature for many of these compositions will be available soon. * Visit the Paramount Guitars website to see guitars from some of these luthiers and more! "I received the CDs yesterday and had a chance to listen in entirety to Sacred Wood last night and this morning on the way to work. Congratulations on this record. I believe it is the finest acoustic guitar work I have ever heard. It is truly a stunning acoustic guitar achievement . I'm not a professional reviewer by any means, but I know when music is truly great, and this record certainly is. "Spirits" was a remarkable record, but I believe this one transcends it. Sacred Wood is a wonderful journey for the mind and soul. From beginning to end the record has a magical feel...difficult to describe but thoroughly captivating and emotionally uplifting. The songs are just magnificent, each one capturing an individual mood or tone while telling a story. The melodies and notes become lyrics in my head. Each song is like a different chapter in an adventure novel, perfectly flowing together through to a satisfying end. You were wise to use several different guitars, as the sound never becomes boring or redundant and remains refreshing throughout. So many acoustic guitar artists fail to recognize this. Nice way to show off your luthiers as well. The playing is precise and brilliant, but so beautifully understated that it sounds like a mere mortal could play it even though it's not possible. You play the songs with no attempt to show off your playing dexterity, and therein lies the beauty of this record. The songs always make the difference in any record, and what comes through on Sacred Wood first are the songs, and then almost simultaneously you realize how damn good the playing is. So many times artists get this backwards and their records become boring very quickly. Thanks for this record. It will be a staple of my music library for many years to come." "Midwestern Fingerstyle guitarist, Kenn Fox, has a long and accomplished career- releasing eight solo albums to date, as well as five others with his wife and collaborator, Blues vocalist, Mare Edstrom. While his album projects usually feature a “Who’s Who” of Wisconsin talent, a completely solo recording is something often contemplated but never done...until now. As the proprietor of Paramount Guitars (a high-end Guitar Gallery), Fox has endless exposure to unique hand-made instruments. This project grew out of both his love for fine instruments and his life-long fascination with fingerstyle guitar. So in the winter of 2007, after selecting guitars by four of his favorite builders, Fox began writing. 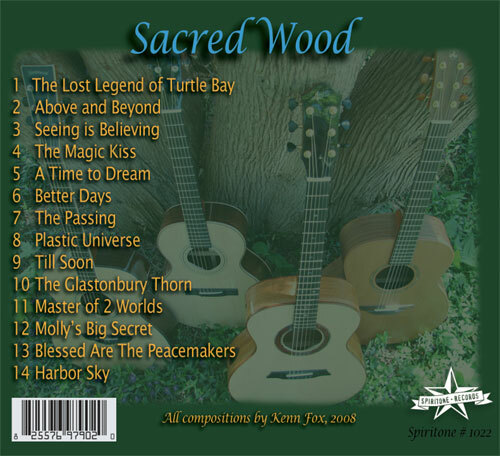 Since the Paramount website features soundbites of each new guitar, this became a forum for accumulated ideas that eventually became the fourteen new compositions featured on Sacred Wood. The guitars chosen for the project, were built by four different Luthiers, and feature different wood combinations and build styles.The album allows the listener the opportunity to study and compare, truly a delight for the connoisseur of fine instruments. The liner notes include lots of technical info and color photos of each guitar. Each of the solo compositions was written on and for one of these guitars. Every composition is an exploration of texture and melody with a predominant Celtic flavor appearing throughout the recording. Tablature of many of the tracks will be available soon.